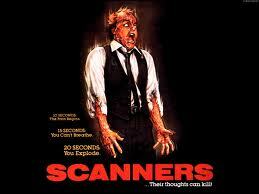 Scanners is a novelisation of the film of the same name directed by the genius David Cronenberg. I know for a fact I have seen the film, yet I cannot recall anything about it, apart from the infamous head explosion scene (which the book has a photo of on the back cover), and the fact that Patrick McGoohan is in it (he of The Prisoner fame). The book I guess closely follows the plot of the film. A transient; Cam Vale is recruited by a shady company ConSec who deal in protection. Part of their business involves a Dr Ruth who trains 'scanners'. In the world of the book scanners are a rare type of people who have the ability to read peoples minds, as well as control them via 'scanning' they also have the ability to literally overload peoples brains causing their heads to explode. Dr Ruth wants Cam to use his scanning gift to track down an evil scanner called Darryl Revok who seems to be power mad, and very psychically strong. The book is really quite short. There are around 150 pages, but the writing is very large. Leon Whiteson (the author) does not seem to branch off into any detail anywhere. It reads exactly like a film with no additional background, or plot to differentiate from the film. It is a real roller coaster ride. Cam is tracking down Revok, but also being hunted by the man, with Revok's soldiers constantly gunning for him, and everyone he comes into contact with. There is a bit of violence in the book, and the actual psychic violence is well described, with eyeball poppings, head explosions, and bleeding nostrils a plenty. There is a love interest, plot twists, and action, but it all flies by at such a pace that there is never any room to actually care about any of the characters. The book took me around 45 minutes to read, was brainless fun really, not remotely deep, it wont leave you thinking, but simply written to ensure its appeal to the masses.